A little adversity builds character, or so the saying goes. True or not, the saying does seem an apt description of a developmental phenomenon that shapes gene expression. While it knows nothing of character, the gene expression apparatus appears to respond well to short-term mitochondrial stress that occurs early in development. In fact, transient stress seems to result in lasting benefits. These benefits, which include improved metabolic function and increased longevity, have been observed in both worms and mice, and may even occur—or be made to occur—in humans. Gene expression is known to be subject to reprogramming by epigenetic modifiers, but such modifiers generally affect metabolism or lifespan, not both. A new set of epigenetic modifiers, however, has been found to trigger changes that do just that—both improve metabolism and extend lifespan. Scientists based at the University of California, Berkeley, and the École Polytechnique Fédérale de Lausanne (EPFL) have discovered enzymes that are ramped up after mild stress during early development and continue to affect the expression of genes throughout the animal’s life. When the scientists looked at strains of inbred mice that have radically different lifespans, those with the longest lifespans had significantly higher expression of these enzymes than did the short-lived mice. Details of the work, which appeared online April 29 in the journal Cell, are presented in a pair of papers. One paper (“Two Conserved Histone Demethylases Regulate Mitochondrial Stress-Induced Longevity”) resulted from an effort led by Dillin and the EPFL’s Johan Auwerx. The other paper (“Mitochondrial Stress Induces Chromatin Reorganization to Promote Longevity and UPRmt”) resulted from an effort led by Dillin and his UC Berkeley colleague Barbara Meyer. According to these papers, mitochondrial stress activates enzymes in the brain that affect DNA folding, exposing a segment of DNA that contains the 1500 genes involved in the work of the mitochondria. A second set of enzymes then tags these genes, affecting their activation for much or all of the lifetime of the animal and causing permanent changes in how the mitochondria generates energy. The first set of enzymes—methylases, in particular LIN-65—add methyl groups to the DNA, which can silence promoters and thus suppress gene expression. By also opening up the mitochondrial genes, these methylases set the stage for the second set of enzymes—demethylases, in this case jmjd-1.2 and jmjd-3.1—to ramp up transcription of the mitochondrial genes. When the researchers artificially increased production of the demethylases in worms, all the worms lived longer, a result identical to what is observed after mitochondrial stress. “By changing the epigenetic state, these enzymes are able to switch genes on and off,” Dillin noted. This happens only in the brain of the worm, however, in areas that sense hunger or satiety. “These genes are expressed in neurons that are sensing the nutritional status of the animal, and these signals emanate out to the periphery to change peripheral metabolism,” he continued. “It seems that, while extreme metabolic stress can lead to problems later in life, mild stress early in development says to the body, ‘Whoa, things are a little bit off-kilter here, let’s try to repair this and make it better.’ These epigenetic switches keep this up for the rest of the animal’s life,” Dillin stated. Across eukaryotic species, mild mitochondrial stress can have beneficial effects on the lifespan of organisms. Mitochondrial dysfunction activates an unfolded protein response (UPRmt), a stress signaling mechanism designed to ensure mitochondrial homeostasis. Perturbation of mitochondria during larval development in C. elegans not only delays aging but also maintains UPRmt signaling, suggesting an epigenetic mechanism that modulates both longevity and mitochondrial proteostasis throughout life. 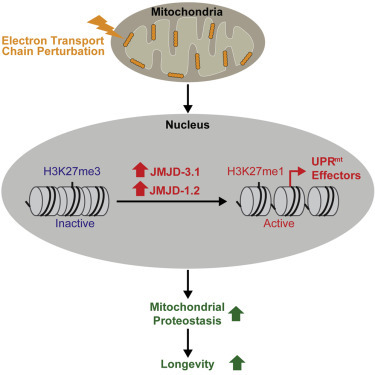 We identify the conserved histone lysine demethylases jmjd-1.2/PHF8 and jmjd-3.1/JMJD3 as positive regulators of lifespan in response to mitochondrial dysfunction across species. Reduction of function of the demethylases potently suppresses longevity and UPRmt induction, while gain of function is sufficient to extend lifespan in a UPRmt-dependent manner. A systems genetics approach in the BXD mouse reference population further indicates conserved roles of the mammalian orthologs in longevity and UPRmt signaling. These findings illustrate an evolutionary conserved epigenetic mechanism that determines the rate of aging downstream of mitochondrial perturbations. Siddharha Mukherjee won the 2011 Pulitzer Prize in non-fiction for his book, The Emperor of All Maladies. The book has received widespread acclaim among lay audience, physicians, and scientists alike. Last year the book was turned into a special PBS series. But, according to a slew of scientists, we should all be skeptical of his next book scheduled to hit book shelves this month, The Gene, An Intimate History. Publishing an article on epigenetics in the New Yorker this week–perhaps a selection from his new book–Mukherjee has waltzed into one of the most active scientific debates in all of biology: that of gene regulation, or epigenetics. Jerry Coyne, the evolutionary biologist known for keeping journalists honest, has published a two part critique of Mukherjee’s New Yorker piece. The first part–wildly tweeted yesterday–is a list of quotes from Coyne’s colleagues and those who have written in to the New Yorker, including two Nobel prize winners, Wally Gilbert and Sidney Altman, offering some very unfriendly sentences. The second part is a thorough scientific rebuttal of the Mukherjee piece. It all serves as a great drama about one of the most contested ideas in biology and also as a cautionary tale to journalists, even experienced writers such as Mukherjee, about the dangers of wading into scientific arguments. Readers may remember that a few years ago, science writer, David Dobbs, similarly skated into the same topic with his piece, Die, Selfish Gene, Die, and which raised a similar shitstorm, much of it from Coyne. Mukherjee’s mistake is in giving credence to only one side of a very fierce debate–that the environment causes changes in the genome which can be passed on; another kind of evolution–as though it were settled science. Either Mukherjee, a physicisan coming off from a successful book and PBS miniseries on cancer, is setting himself up as a scientist, or he has been a truly naive science reporter. If he got this chapter so wrong, what does it mean about an entire book on the gene? Coyne quotes one of his colleagues who raised some questions about the New Yorker’s science reporting, one particular question we’ve been asking here at Mendelspod. How do we know what we know? Does science now have an edge on any other discipline for being able to create knowledge? But the New Yorker has not fallen into this trap on GMOs and most of their pieces on the topic–mainly by Michael Specter–have been decidedly pro science and therefore decided pro GMO. So what led Mukherjee to play scientist as well as journalist? There’s no question about whether I enjoy his prose. His writing beautifully whisks me away so that I don’t feel that I’m really working to understand. There is a poetic complexity that constantly brings different threads effortlessly together, weaving them into the same light. At one point he uses the metaphor of a web for the genome, with the epigenome being the stuff that sticks to the web. He borrows the metaphor from the Hindu notion of “being”, or jaal. At his best, Mukherjee can take us down the sweet alleys of his metaphors and family stories with a new curiosity for the scientific truth. He can hold a mirror up to scientists, or put the spotlight on their work. At their worst, Coyne and his scientific colleagues can reek of a fear of language and therefore metaphor. The always outspoken scientist and author, Richard Dawkins, who made his name by personifying the gene, was quick to personify epigentics in a tweet: “It’s high time the 15 minutes of underserved fame for “epigenetics” came to an overdue end.” Dawkins is that rare scientist who has consistently been as comfortable with rhetoric and language as he is with data. Hats off to Coyne who reminds us that a metaphor–however lovely–does not some science make. If Mukherjee wants to play scientist, let him create and gather data. If it’s the role of science journalist he wants, let him collect all the science he can before he begins to pour it into his poetry. October 6, 1942, my mother was born twice in Delhi. Bulu, her identical twin, came first, placid and beautiful. My mother, Tulu, emerged several minutes later, squirming and squalling. The midwife must have known enough about infants to recognize that the beautiful are often the damned: the quiet twin, on the edge of listlessness, was severely undernourished and had to be swaddled in blankets and revived. The first few days of my aunt’s life were the most tenuous. She could not suckle at the breast, the story runs, and there were no infant bottles to be found in Delhi in the forties, so she was fed through a cotton wick dipped in milk, and then from a cowrie shell shaped like a spoon. When the breast milk began to run dry, at seven months, my mother was quickly weaned so that her sister could have the last remnants. Tulu and Bulu grew up looking strikingly similar: they had the same freckled skin, almond-shaped face, and high cheekbones, unusual among Bengalis, and a slight downward tilt of the outer edge of the eye, something that Italian painters used to make Madonnas exude a mysterious empathy. They shared an inner language, as so often happens with twins; they had jokes that only the other twin understood. They even smelled the same: when I was four or five and Bulu came to visit us, my mother, in a bait-and-switch trick that amused her endlessly, would send her sister to put me to bed; eventually, searching in the half-light for identity and difference—for the precise map of freckles on her face—I would realize that I had been fooled. But the differences were striking, too. My mother was boisterous. She had a mercurial temper that rose fast and died suddenly, like a gust of wind in a tunnel. Bulu was physically timid yet intellectually more adventurous. Her mind was more agile, her tongue sharper, her wit more lancing. Tulu was gregarious. She made friends easily. She was impervious to insults. Bulu was reserved, quieter, and more brittle. Tulu liked theatre and dancing. Bulu was a poet, a writer, a dreamer. The Minnesota twin study raised questions about the depth and pervasiveness of qualities specified by genes: Where in the genome, exactly, might one find the locus of recurrent nightmares or of fake sneezes? Yet it provoked an equally puzzling converse question: Why are identical twins different? Because, you might answer, fate impinges differently on their bodies. 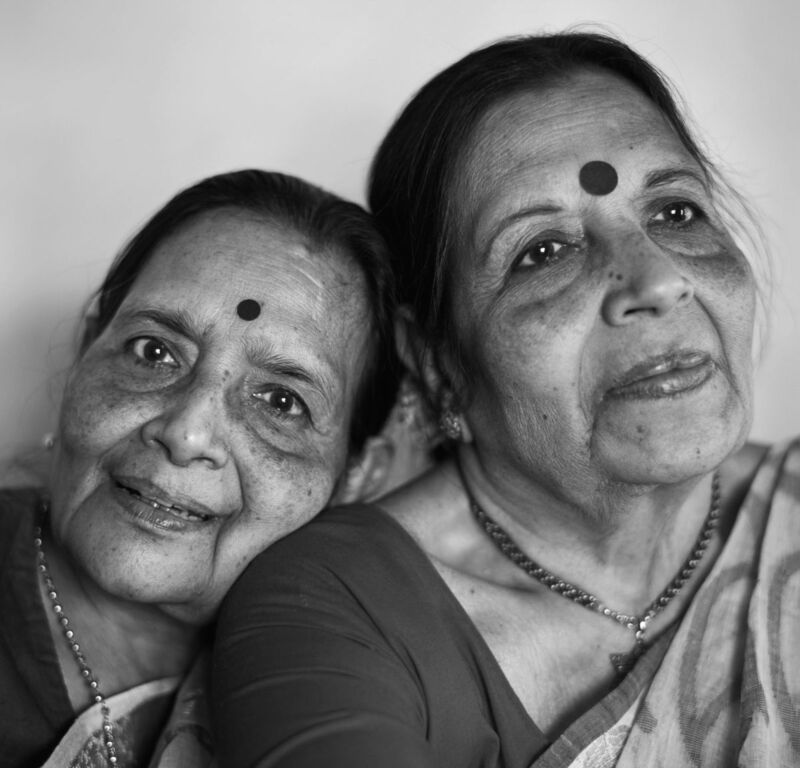 One twin falls down the crumbling stairs of her Calcutta house and breaks her ankle; the other scalds her thigh on a tipped cup of coffee in a European station. Each acquires the wounds, calluses, and memories of chance and fate. But how are these changes recorded, so that they persist over the years? We know that the genome can manufacture identity; the trickier question is how it gives rise to difference. “Histones had been known as part of the inner scaffold for DNA for decades,” Allis went on. “But most biologists thought of these proteins merely as packaging, or stuffing, for genes.” When Allis gave scientific seminars in the early nineties, he recalled, skeptics asked him why he was so obsessed with the packing material, the stuff in between the DNA. …. A skein of silk tangled into a ball has very different properties from that same skein extended; might the coiling or uncoiling of DNA change the activity of genes? esterday I gave readers an assignment: read the new New Yorkerpiece by Siddhartha Mukherjee about epigenetics. The piece, called “Same but different” (subtitle: “How epigenetics can blur the line between nature and nurture”) was brought to my attention by two readers, both of whom praised it. Mukherjee, a physician, is well known for writing the Pulitzer-Prize-winning book (2011) The Emperor of All Maladies: A Biography of Cancer. (I haven’t read it yet, but it’s on my list.) Mukherjee has a new book that will be published in May: The Gene: An Intimate History. As I haven’t seen it, the New Yorker piece may be an excerpt from this book. Because Mukherjee writes very well, and because even educated laypeople won’t know the story of gene regulation revealed over the last few decades, they may not see the big lacunae in his piece. It is, then, important to set matters straight, for at least we should know what science has told us about how genes are turned on and off. The criticism of Mukherjee’s piece, coming from scientists who really are experts in gene regulation, shows a lack of care on the part of Mukherjee and theNew Yorker: both a superficial and misleading treatment of the state of the science, and a failure of the magazine to properly vet this piece (I have no idea whether they had it “refereed” not just by editors but by scientists not mentioned in the piece). This description greatly misrepresents the original concept. Waddington argued that development proceeds not by the loss (or gain) of genes, which would be a “genetic” process, but rather that some genes would be selectively expressed in specific and complex cellular patterns as development proceeds. He referred to this intersection of embryology (then called “epigenesis”) and genetics as “epigenetic”.We now understand that regulatory proteins work in combinations to turn on and off genes, including their own genes, and that sometimes the regulatory proteins respond to signals sent by other cells. It should be emphasized that Waddington never proposed any “ghost-like” layer of additional information hovering above the gene. This is a later misinterpretation of a literal translation of the term epigenetics, with “epi-“ meaning “above/upon” the genetic information encoded in DNA sequence. Unfortunately, this new and pervasive definition encompasses all of transcriptional regulation and is of no practical value. I hope that this piece brings greater clarity to the discussion. I have heard the use of the term “epigenetics” for over a decade. The term was never so clear. I think that the New Yorker article was a reasonable article for the intended audience. It was not intended to clarify debates about a mechanism for epigenetic based changes in evolutionary science. I think it actually punctures the “classic model” of the cell depending only on double stranded DNA and transcription, which deflates our concept of the living cell. The concept of epigenetics was never really formulated as far as I have seen, and I have done serious work in enzymology and proteins at a time that we did not have the technology that exists today. I have considered with the critics that protein folding, protein misfolding, protein interactions with proximity of polar and nonpolar groups, and the regulatory role of microRNAs that are not involved in translation, and the evolving concept of what is “dark (noncoding) DNA” lend credence to the complexity of this discussion. Even more interesting is the fact that enzymes (and isoforms of enzymes) have a huge role in cellular metabolic differences and in the function of metabolic pathways. What is less understood is the extremely fast reactions involved in these cellular reactions. These reactions are in my view critical drivers. This is brought out by Erwin Schroedinger in the book What is Life? which infers that there can be no mathematical expression of life processes.